Slam Funk Scratch Card Guide & Review - Casino Answers! Slam Funk is an instant win scratch card game from Microgaming. 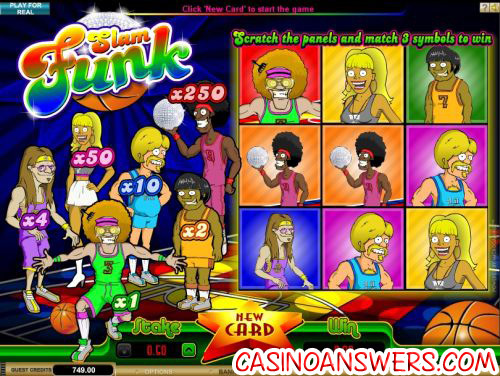 You can play Slam Funk at First Web Casino and Virtual City Casino. To start playing Slam Funk, you must first choose a stake. Wagers are $0.50, $1, $2, $3, $4, $5, $6, $7, $8, $9 and $10. Once you have chosen your stake, you can hit “New Card” to start the game. Once you have a fresh card, you can hit “Reveal All” to scratch all of the panels automatically or you can click them yourself. It’s your choice. Payouts are listed at the left side of the screen. They are 1X, 2X, 4X, 10X, 50X and 250X (the top prize). The maximum win on the Slam Funk instant win scratch card is $2500. When you get a win on Slam Funk, you will be treated to an animation with music and sound effects. Each winning combination will provide you with a different one, which will add additional incentive for you to try and win all of them! Due to its goofy sense of humour, Slam Funk is a fun scratch card to play. Other pros to playing Slam Funk are the you can play games very rapidly if you wish and inheritly as a scratch card, it’s very easy to play. For those looking to shoot some hoops and dance the night away, head over to First Web Casino to take advantage of their 100% up to $75 signup bonus – perfect for scratch card players! Can I get a no deposit bonus to play the Slam Funk scratch card game? Sure! You can get a $10 free cash no deposit bonus at Virtual City Casino if you’re looking to try Slam Funk without making a deposit first. You must register a credit card to be credited with the no deposit bonus. Can players from the United States play Slam Funk for real money? USA players cannot play at Microgaming casinos like First Web Casino for real money, but they can play some the excellent scratch cards over at the US-friendly Rockbet Casino. Rockbet frequently offers bonuses specifically for scratch card players! What is the most I can win playing the Slam Funk instant win game? If you bet $10 playing Slam Funk and it happens to be your lucky day, you can win up to $2,500 on a single game! What instant win scratch cards are there? What basketball themed casino games are there?